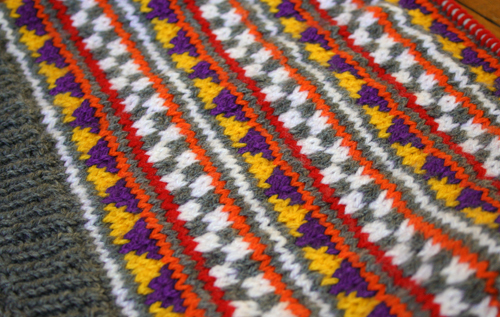 Knit a row, purl a row, change colors mid row, multiples times....ACK! what was I thinking? I think I had a weak moment and too many balls of left over yarn. Needless to say this one has been real interesting to knit up. I wouldn't describe the work as difficult, rather tedious. I'm almost finished it so I'll save the "who it is for," for another day. I sure hope the recipient is grateful, though secretly I'm thinking he really won't give a darn. on and get back to a bit of a regular schedule, especially my sleep. Have a lovely day.